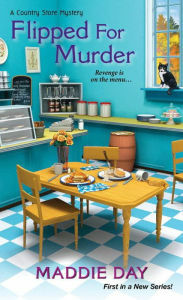 Maddie Day's Flipped for Murder launches a cozy mystery series that's slightly different from a number of popular ones today. Day's characters are realistic, rather than the quirky ones often found in small-town mysteries. And, her amateur sleuth doesn't set out to solve a murder investigation. She's just trying to keep herself out of jail. Flipped for Murder is refreshing in its outlook. In the three years Robbie Jordan has been in South Lick, Indiana, she was working to save up the money to buy and operate a place that combines her dreams. When she opens Pans 'N Pancakes in a one hundred fifty-year-old building, it's "a warm, welcoming country store, a cozy breakfast-and-lunch place, and a treasure trove of antique cookware". She had help from her aunt, her real estate lawyer, Jim, and her friend, Phil. She didn't have a great deal of help from Stella Rogers, the mayor's assistant, who seemed to put innumerable roadblocks in her way when it came to permits. But, that doesn't mean she wanted the woman dead. And, as a restaurant owner, she isn't thrilled to find out Stella had one of Robbie's cheesy biscuits stuffed down her throat. Normally, South Lick's small police force would ask for help from the Brown County Homicide Unit. But, they're small as well, and have their hands full with another case. So, it's up to the local police to probe for motives. And, as Robbie discovers, there are a lot of people in town who might have wanted to kill the mayor's assistant. But, evidence seems to point to Robbie. Day's first Country Store mystery introduces a hard-working, determined sleuth. Readers will admire her grit, while salivating over the breakfasts served at Pans 'N Pancakes. Robbie does have the obligatory two men interested in dating her, and she adopts a cat. But, that doesn't mean there's anything else typical about Flipped for Murder. There are some strong-willed characters, such as the mayor, but the cast isn't made of eccentric people. Instead, they're realistic, unpretentious residents of a small Midwestern town. The police are not made to look stupid. And, Robbie is caught up in the case as a victim more than as an amateur sleuth. She has an interest in finding the killer, but doesn't have much time because she's the owner of a new business. Flipped for Murder takes place in just over a week. It may be the longest week of Robbie Jordan's life, though, as she opens a restaurant, finds herself atop a suspect list, and learns a secret from her mother's life. Welcome to Maddie Day's South Lick, Indiana, an imaginary setting rich in atmosphere. The characters and Robbie's restaurant, Pans 'N Pancakes, come alive in this refreshing, enjoyable mystery, Flipped for Murder. If you would like to talk to the author, Edith Maxwell (Maddie Day), will be appearing at the North Park Library in Evansville, Indiana, on Nov. 2 at 6 PM. She'll be talking about her books, the origins of her Indiana setting, and signing books. The books will be for sale that evening. Flipped for Murder by Maddie Day. Kensington Publishing Company. 2015. ISBN 9781617739255 (paperback), 342p. FTC Full Disclosure - The author sent me a copy of the book, knowing the library would be hosting her. No review was promised. I look forward to reading this. I may be losing my taste for "quirky characters" so this will be little change. And of course I always check out this author's books! You're not the only one a little tired of quirky characters, Reine.